Olympic champion Katie Archibald hopes the inaugural Women's Tour of Scotland will inspire more women and children to start cycling. August's event is the first to be introduced before a male equivalent and will also offer parity of prize money. Despite the tour clashing with the European Championships, event ambassador Archibald has opted to race on home soil. "There's a huge significance that it's a standalone women's event," she said. "I'm proud to be attached to it and hopefully events like this say to young girls that they can get on a bike, and to women that 'this world is ours, we're competitive and we can race just as hard as the men'." The three-stage race, which will take place from 9-11 August, is 350km in length and will stretch across Dundee, Dunfermline, Perth, Glasgow and Edinburgh. 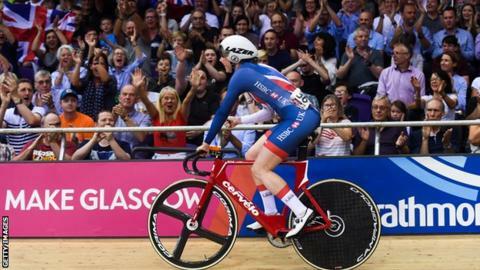 Milngavie native Archibald, who won gold at the 2016 Rio Olympics as part of the team pursuit quartet, is looking forward to racing competitively in Scotland. "It should really give a chance to showcase Scotland and some gorgeous scenery," she said. "Most years I end up missing the Scotland National Road Race so it will be a privilege to be on these roads. "There are lots of nice moments that may not be globally iconic but to me will feel very special." Archibald's next race comes in Manchester in three weeks' time, as she attempts to bounce back from disappointment at the Track Cycling World Championships in Poland. The 24-year-old was ruled out of defending her Madison world title after being concussed while crashing in the Omnium. "I'm pretty dejected," she said. "I'd spent the last 12 months targeting the defence of the Madison world title and obviously I wasn't on the start line there. "Beyond the concussion, the way that I had been riding the day before really did put in question of what I was capable of. I don't know what had gone wrong with me, I was riding like an idiot."